St Luke was a popular dedication for new churches in the period after the Second World War, perhaps reflecting a more contemplative Anglicanism than the muscular kind which had led to lots of St Mark dedications in the 19th Century. This St Luke was built on Rigbourne Hill in 1973 as a chapel of ease to St Michael in the centre of town. 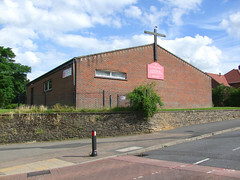 A long hall church built onto an earlier hall, it nevertheless stands out and even dominates by reason of its setting at a hilltop junction. 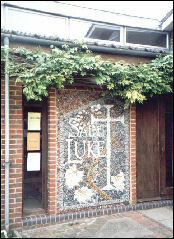 There is little detailing, except for a lovely flint mosaic at the entrance depicting the name of the patron Saint entwined with a vine. Internally, Mortlock thought the font worth remarking on, though I've not seen inside myself. 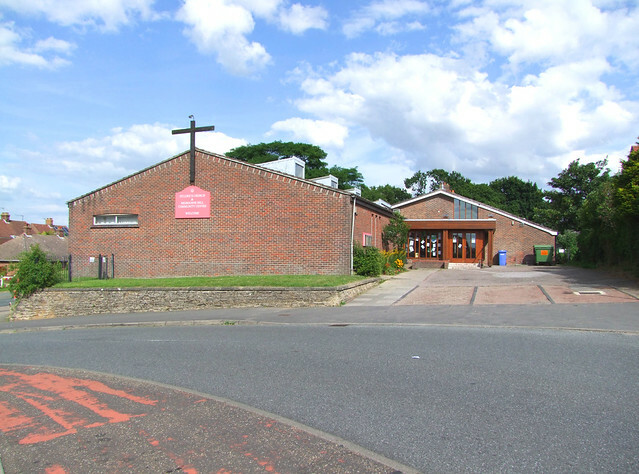 Rigbourne Hill is the biggest and most challenging of the housing estates in Beccles, and so St Luke's presence here is a valued one. I expect that this part of Beccles was at one time part of the parish of Ellough, for the churchyard there is crammed with 18th and 19th Century memorials up to the point that the new Beccles cemetery opened, and yet there are virtually no houses in the modern Ellough parish, and the church there is now redundant.